If you are using SketchUp, then it’s time for you to soon browse over to Google’s website and download the latest version (v.8 M2). Although this release is not a new version but rather a maintenance release (hence the “M2”), there are a few new features and a bunch of bugfixes. Plugins can now be “packaged” in a ZIP file (which has the RBZ extension). This has the advantage that the end user does not need to worry about a plugin’s files and where they need to go. He/she simply needs to go into the program’s preferences and click the “Install Extension…” button. Done! Time for me to re-write my Plugin Loader plugin, I guess. A developer can now program this behaviour into their own plogin using the new Sketchup.install_from_archive(path_to_rbz) method. SketchUp’s support for the COLLADA file format (with a DAE extension) has been improved and made more reliable. This set of tools that was previously only available as an additional plugin is now included in the main installation. Even if you are not a cinematographer, an advantage of these tools is pre-visualizing how a real camera would see a scene. 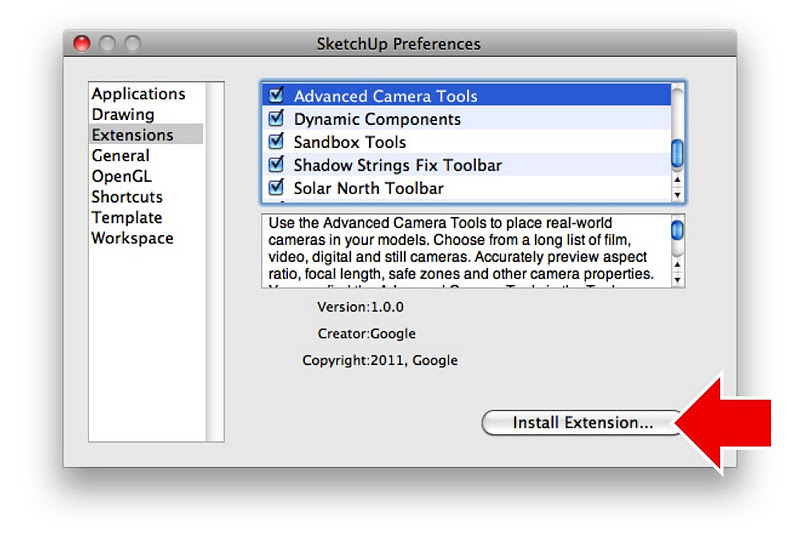 In the past, when a trial for the Pro version ended, SketchUp would simply revert to the free version. This option has now been removed – mainly to reduce user confusion. RBZs in SketchUp 8M2: Distribute Your Plugin as One File!